The layout and appearance of child elements in a DockPanel control is based not only on the Dock property of each child element, but on the order that they are listed in. This is true because layout of a child is determined based on the available space left after all previous children have already been positioned. In the example below, we add two Label controls at the top and bottom of the window and then add a StackPanel with buttons after that. 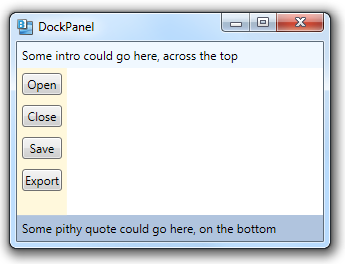 If we move the StackPanel to be the first child of the DockPanel, it takes up the entire left edge of the window. My WPF book doesn’t cover this ordering thing. good to know. But I thinks this design is bad for developer. it is so tedious to keep ordering in mind if you are trying to logically layout those elements.